This is an excerpt of my website in English language. You can also browse my website as usual and my Google Translator Widget will translate every page into your own language! 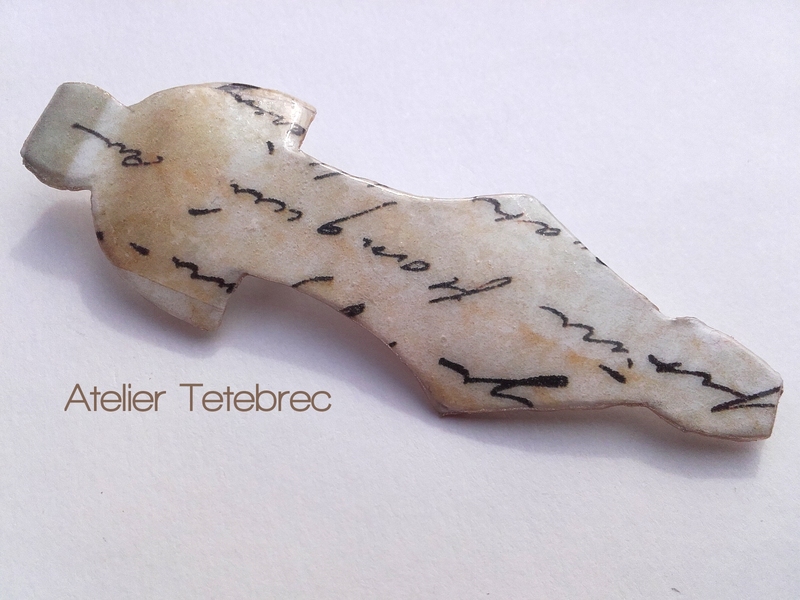 Tetebrec (also tete brec) is a Celtic word and means „sparkling treasure“. In Irish mythology one of the three houses of the royal seat was called Emain Macha, today’s Navan Fort. Where warriors once had deposited their weapons, the Irish „Ulysses“ CuChulainn lay down when he was hit by a fairy’s magic spell. He spent a magical year dreaming in Tetebrec, this place of sparkling treasures between reality and other world. Here he experiences the „fairy time“, in which space and time appear dissolved and boundaries blur. Everything is possible in that colourful sparkling state, which holds the treasure of the dreamer. 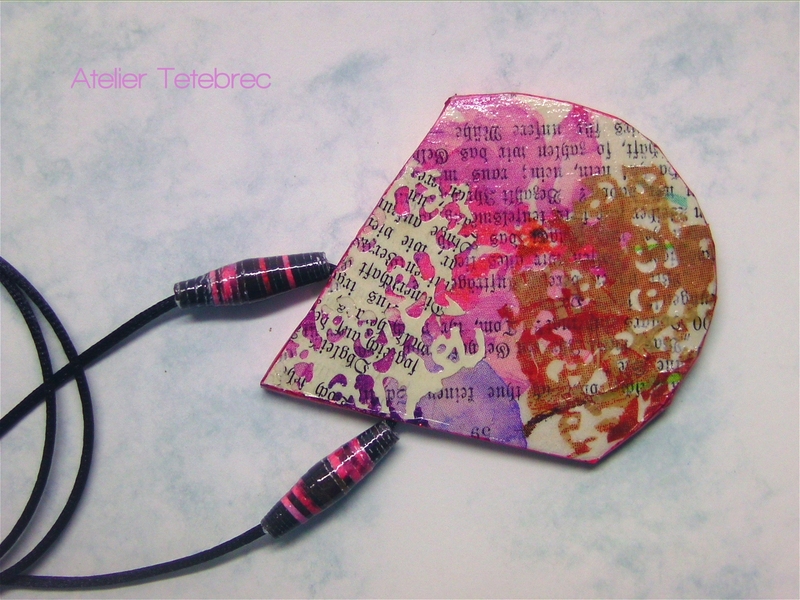 My studio Atelier Tetebrec brings the beauty and sparkle from fantasy into everyday life – portable for everyone. I believe that everyone, young or old, fat or thin, crooked or straight, has her / his own beauty: A beauty that has nothing to do with beauty surgeries and artificial „improvements“ or adjustments to trends. This individual beauty is brought to light from the inside: from our personality, our satisfaction with ourselves. I believe that jewellery can underline this beauty. Just as I can make eyes sparkle with the colour of beads (or look tired with the wrong colour), I can underline my personality with what I wear. 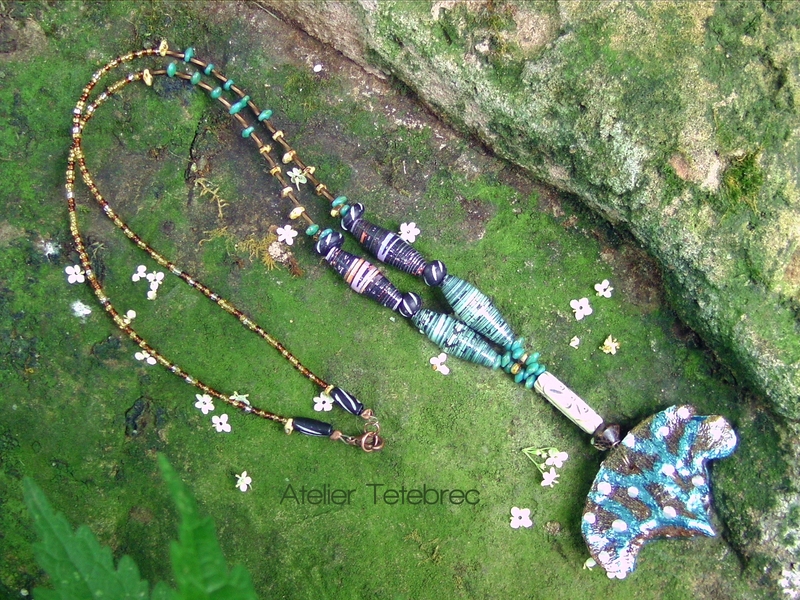 And because every woman and every man is unique, I have decided to offer only handmade artistic unique pieces, as a single piece, in small series or as individual custom-made. Our everyday life is often gray enough, the world sometimes frightening – I want to bring beauty to the world, more resplendence and joy, which will hopefully join your inner glow. Professionally I'm coming from books, from text, from printed media. Of course, I use electronic media and the Internet, but I have a strong affinity to paper: I love its silky to rough surfaces, its fine structures, its smell and noises. This is why paper is the most important material in my jewellery: as paper art, free-style or in the form of quilled beads. 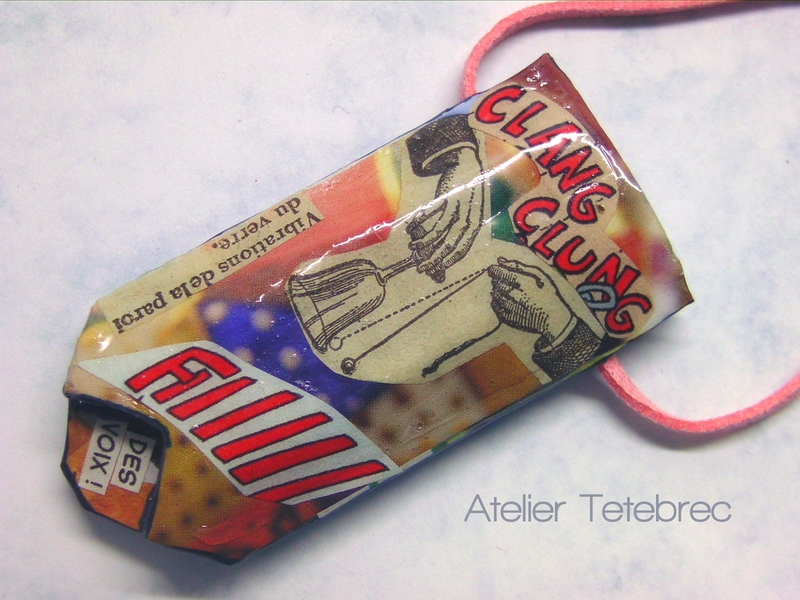 Depending on the challenge I follow two lines: Upcycling from old books, magazines and packaging boxes - or made from artist's cardboard and fine handmade paper. However, the paper is transformed, it's like it remembers its past as a tree: My paper jewellery is hard like wood and sealed moisture-repellent. 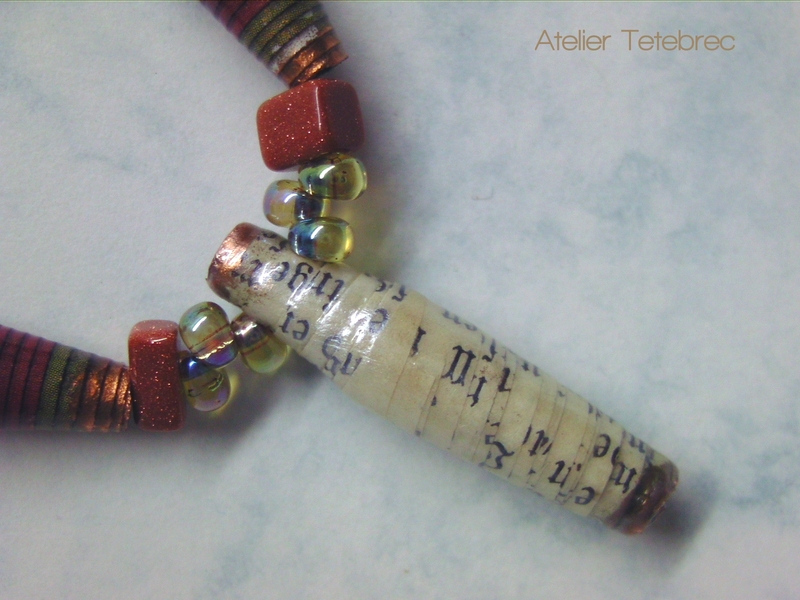 I am telling stories that curl into beads and combine ancient with modern times in jewels. 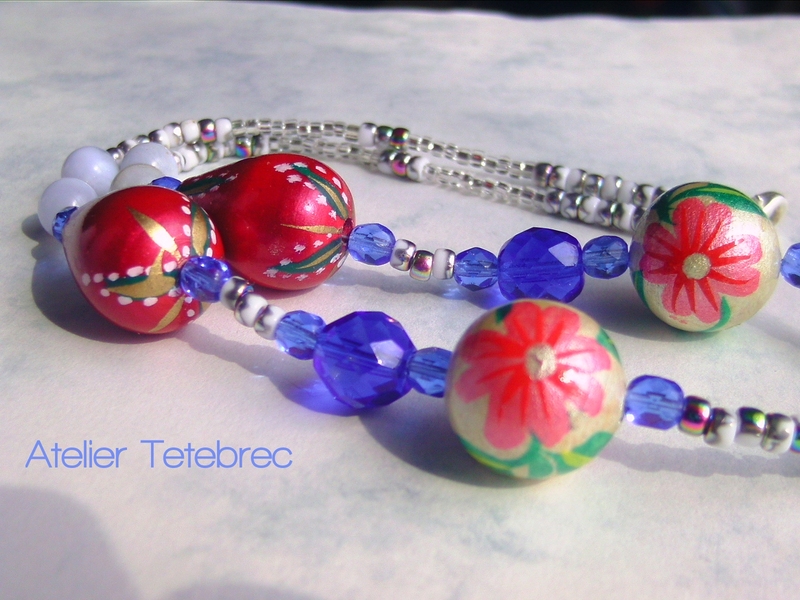 The beads are as diverse as the world: there is glass art and crystall glass from Venice or Bohemia, there are handmade beads from antique books, semi-precious stones, amber, water-coloured unique pieces or precious beads from Asia. 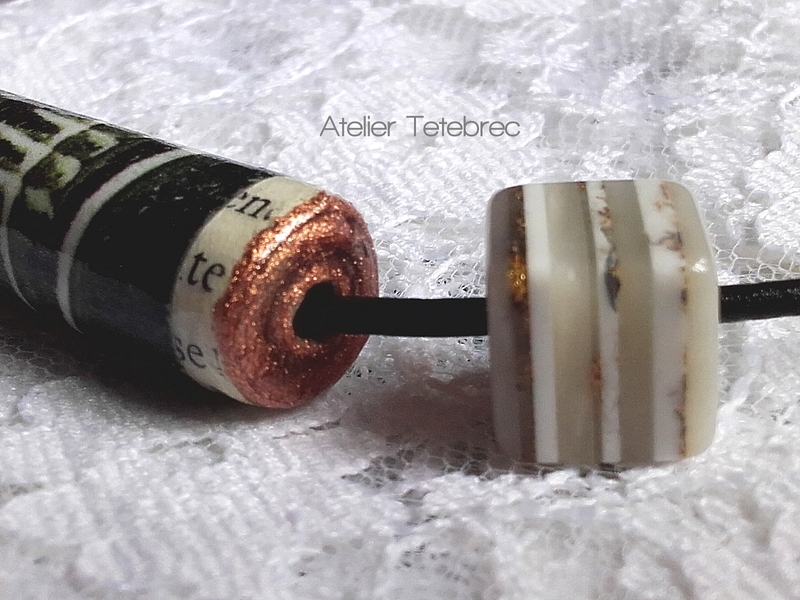 Pictures: Custom-made for a client - paper bead collier "Code"
Specifications: code written by the customer on paper beads, massive looking beads, portable in the business environment. 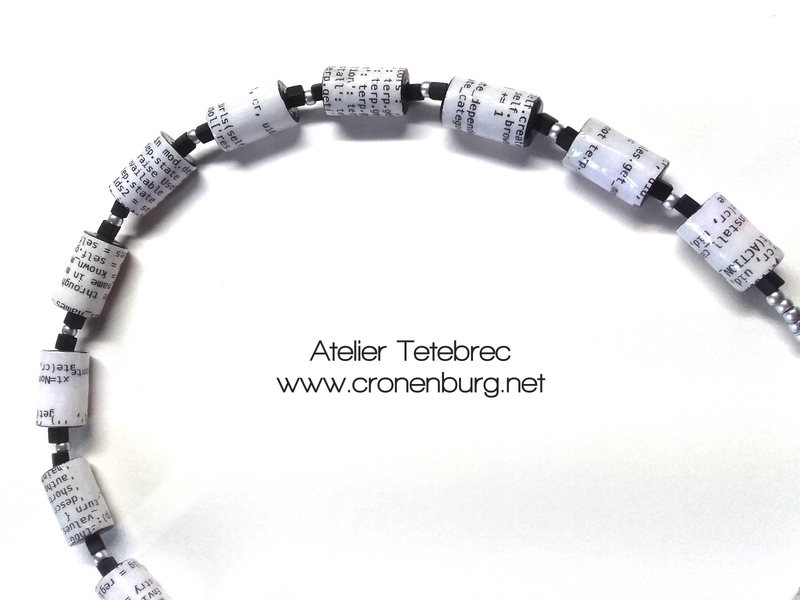 The solution: cylinder beads made of black artist cardboard with a layer of the printed code and Japanese glass art of mat silver rocaille and mat black cubes, silver-plated lobster clasp. I try to offer a good mixture of elegant to opulent and simple to high-quality jewellery in my Etsy Shop. Everyone knows: You buy what you see in the photo. Some pieces show the indication "(Customization) options", telling you, what can be adapted exactly. Sometimes you can get the shown necklace in your personal length, sometimes in your favorite colour. Other variations are also possible. Many customers, however, want a very personal unique piece, while my style and my art meet with their personal wishes. A customer writes e.g. 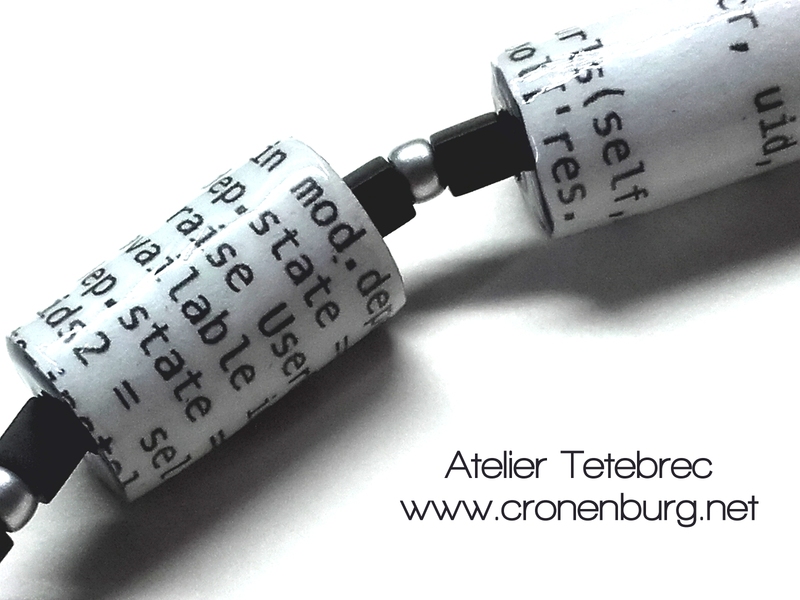 computer programs and would like to have paper beads with her own code, elegant and portable in the business situations (see photos). For two stage artists it may be completely opulent and colourful. There favourite colours should match the clothing. In one necklace, Swarovski crystal may sparkle next to paper beads in the spotlight - the other will be a longer artist's piece with a mix of materials, matching a fascinator for the hair. For such requests you can simply ask by email (only mails are binding, no notes in social media, please). The General Terms and Conditions apply - and it is to be noted that I take an advance for custom-made products and these are excluded from the exchange. 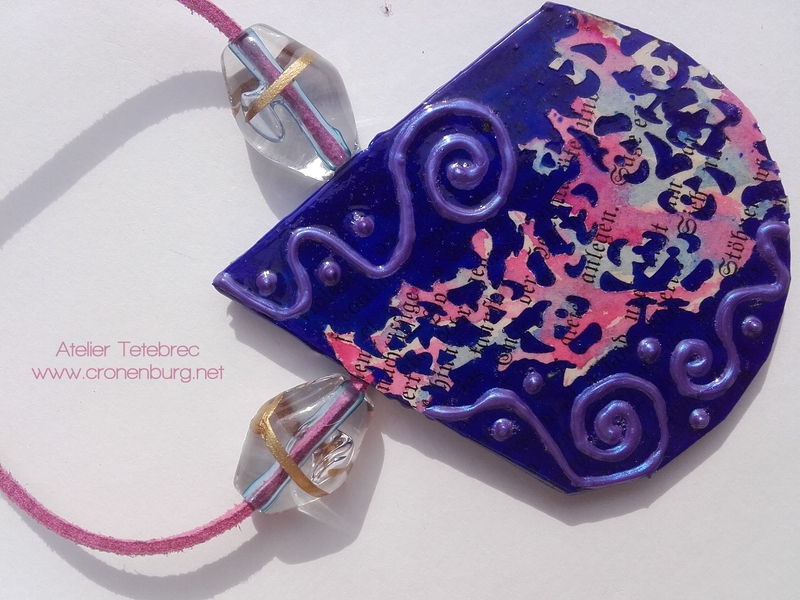 Also, you should allow enough time - paper jewellery needs an average of one week to dry - depending on the paper it is treated 2-3 times and varnished as often. Of course, first come first served. There may be waiting times especially during peak periods like the pre-Christmas period, because I work alone in the studio! 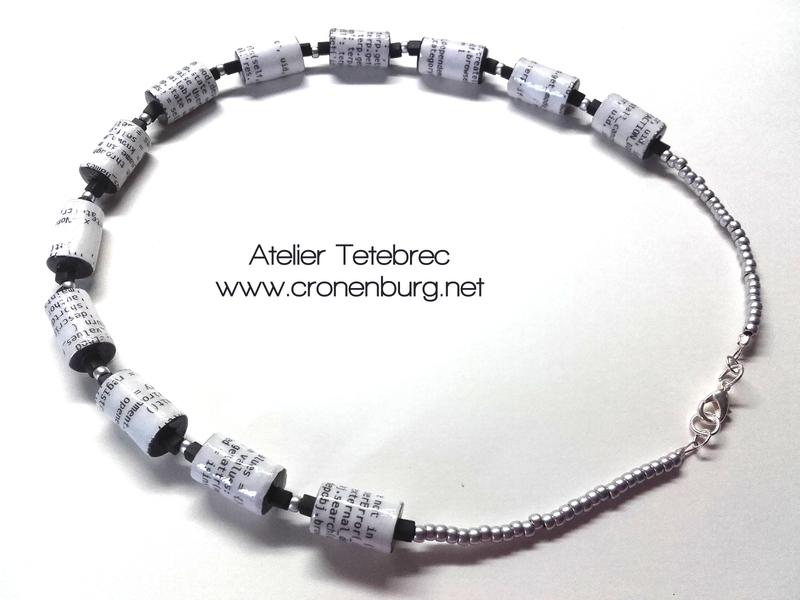 You can email me a description of your own ideas and what kind of jewellery you would like to have: necklace (with length), bracelet, earrings etc. Very helpful for planning is a maximum budget, you would like to spend. After this information, I write back what is possible or not. I will ask for better understanding or discuss individual parts with the customer. Important: Feasibility and budget. If we agree with each other, I calculate a binding cost estimation with a detailed description and indication of the advance. You can now either completely disembark or you must officially accept it. I also guess about the time until completion. In addition there is a drawing, as I imagine the jewellery. I do not make such designs infinitely, change requests can be specified only once. 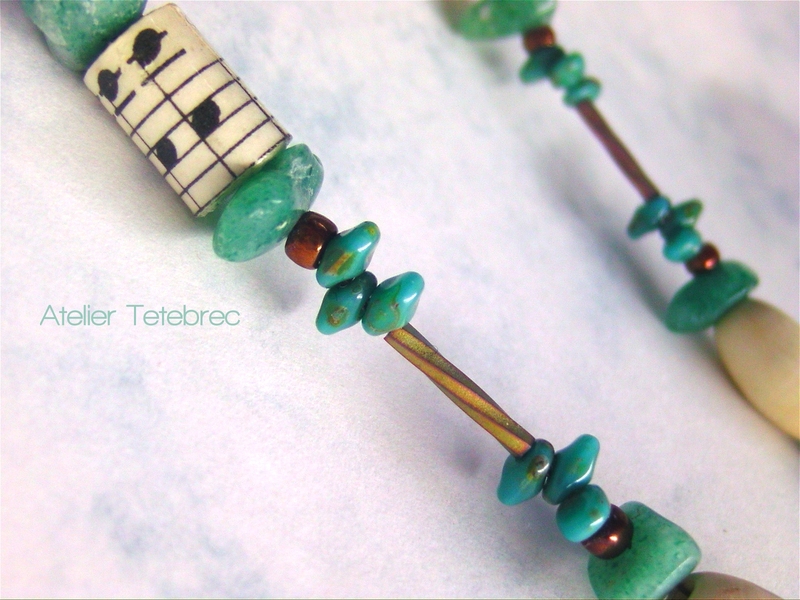 And I would like to point out that you will always get a piece of jewellery in my own style, as the Atelier Tetebrec stands for that! With the acceptance of the cost estimate, you also inform me if you wish to transfer the money by banque or pay via Paypal (the latter speeds up the process, while a transfer abroad takes about 3-4 working days or longer, depending on the origin country). If the cost estimate and the draft have been accepted by you, the advance payment is due. The customer receives my payment contact or an invoice by Paypal with payment link via e-mail. As soon as the advance has arrived, I'll begin with the work. Of course, I remain in contact with you, should anything unforeseen arise. Shortly before completion I send an invoice (pdf in a mail) for the residual sum. Only when this money arrived, I'll send the piece of jewellery, the original invoice will be attached to the package. You can follow the letter by a number. I am, of course, curious how you like my jewellery, so I am glad about every feedback. Maybe I may even post your feedback on my website? By the way, I also make jewelry for men. There are limits to feasibility for me. If these are too tight for you, you will surely find alternatives elsewhere. 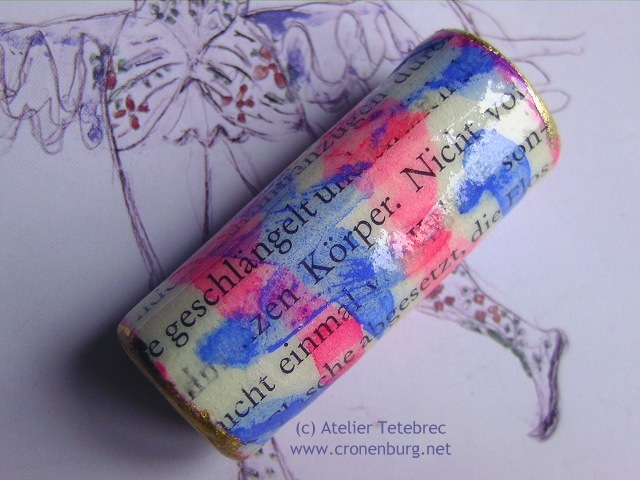 Each paper reacts differently, each has a completely different chemical behaviour due to its composition and varnishes. Also the thickness and flexibility of a paper decides on feasible forms. Paints, printing colours or inks could smear in an ugly way or dissolve in the worst case. Here the customers have to trust me and my long researches and experiments. If I say something does not work then that is just the way it is. Even if a piece of jewellery in the shop may be perceived by the customer as so similar to the pattern I have rejected, it is really completely different. Laypersons can not recognize the differences so easily. I do not leave my customers, of course, without giving them alternatives. Only sometimes there is simply a no! 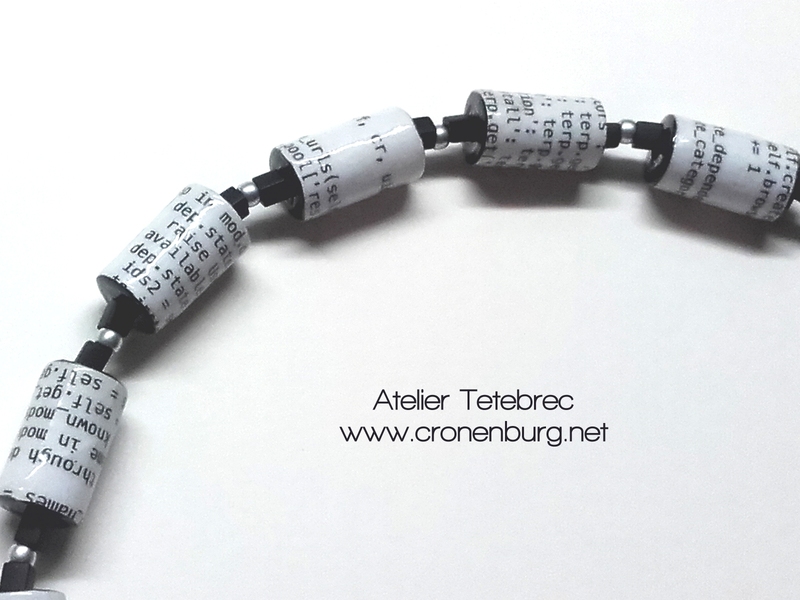 When it comes to genuine jewellery craft, my possibilities are also limited. That is why I offer no real gold jewellery, but work with finished parts. Depending on the colours, the metal parts of my jewellery are available either with a copper-galvanized Zamac alloy or with silver-plated Zamac, absolutely free of nickel. The latter can be replaced with sterling silver with a corresponding surcharge. Also gilded parts are possible. More about the selection of my material look here in my FAQ and for the care of the jewellery here. 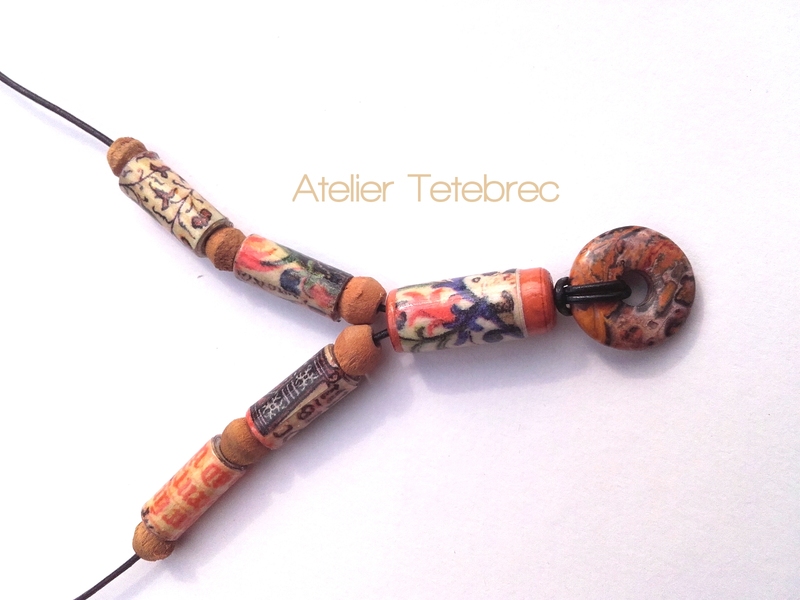 As a brand Atelier Tetebrec stands for a certain style, for loving craftsmanship and high quality from artist's hand. I will not imitate the style of others because of the copyright: If you want me to sell a necklace that looks like the design of XY, please order directly from XY. I will not move away completely from my own style and claims, so if someone would want me to say meticulously which bead I should like to thread where - it's not my way of working. Such work can be done more cheaply by yourself - or ask for low-cost-craftsmen. Sustainability is part of my company philosophy, as far as it is controllable and feasible. 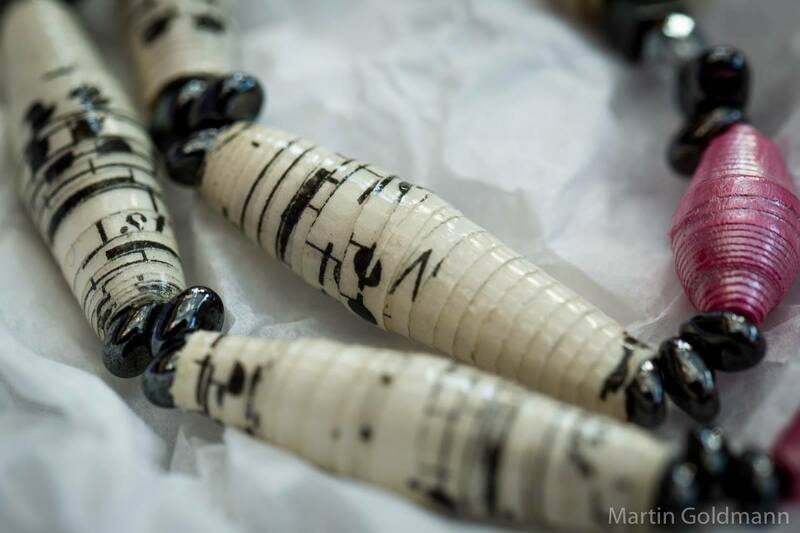 I deliberately do not buy from Chinese or African paper wholesalers, every paper bead is made by my own. When I use e.g. bones, the raw materials, which are processed in smaller manufacturies, come from waste, i.e. recycling. I do not use certain products in principle: If they are of doubtful origin or, possibly, poisonous or forbidden. There are sometimes requests, e.g. according to antique beads or mammoth tusks - I reject this because of my knowledge, that there are guaranteed no "clean" sources availible for me. There are not only many forgeries on the market, the forbidden smuggling is flourishing and very often one would finance criminal groups with the purchase. Of course, I do not support such a thing! But I can assure you: the selection of impeccable material is immense - I will always find something fascinating!